I live in New England in the middle of the woods. It’s a fact of life that little (and quite large) creatures tend to try and enjoy the comforts of one’s home as much as the owner of said property does. This generally leads to shrieks during the night when one encounters unexpected guests, disappointment to discover your pantry has been raided or worse — the wee hour gnawing sounds that come from mice making a nice pile of sawdusts out of our centerbeams in your ceiling or support structures in your walls. I’ve tried every conceivable remedy — focusing on non-lethal solutions. They’ve worked to a point, but that point hits the one that everyone knows (you know, the diminishing one) and the volume of influx outpaces the ability to trap and release. We went with traditional snap traps but those were still expensive and were often bypassed. Sneaky buggers. Now I have 6 of these amazing little boxes sprinkled strategically around Casa Hoff. The Rat Zapper. It’s a AA battery-powered electric chair for vermin. It works. Flawlessly. No evasion. No mess. Relatively (if I do say so myself) humane. Easy to reload/use again. You put some nuts down one end, flip a switch and come back to empty when the LED blinks. I no longer have a vermin problem…except for the flying squirrels. I have a tactical nuke planned for those little bastards. 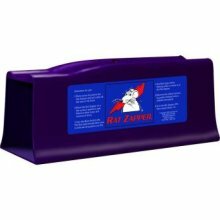 Each Rat Zapper runs about $40 at a hardware store or here (Google) but SO worth it. You could always just buy Jerry and Andy, surely this would deal with any internet pests and potential rats you may come across.